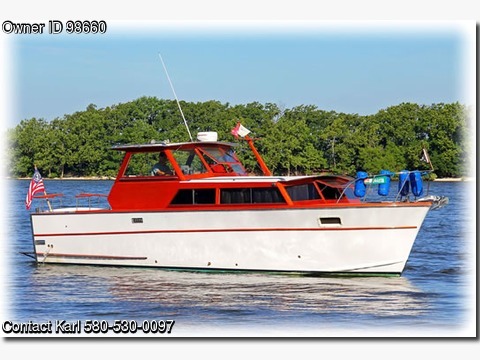 Boat is located in Grand Lake,Oklahoma.Please contact the owner @ 590-530-zero zero nine seven or keg123(at)att(dot)net…Best wood boat award Heartland Classic show. Westerbeke genset, 2 amplifier, 9 speaker stereo, hydraulic steer, marine water heater, central heatair, inverter, head has sink, marine toilet, shower, storage, galley has sink, refrigerator, microwavetoaster, Blue Sea electric panel, Raymarine electronics – radar, depth soundertempspeed, VHS, detachable propane grill, 4 gel batteries, lights include overhead V berth, cabin, and cockpit, backlit dash, underwater light, aft docking. Electric windlass, stern washdown pump, twin horns, windshield wiper, custom mahogany swim deck with dual boarding ladders, 3 bilge pumps. Cabin has carpeted flooring, dinettebed, sofa, V berth, galley, and head. Beautiful mahoganyepoxy decking on gunwales, bow, and cockpit. Twin bilge blowers, fire extinguishers, accessory ports, 120 V receptacles throughout. Stainless trim and rubrails, non-slip pain on cabincockpit roofs, 2 shore power receptacles.